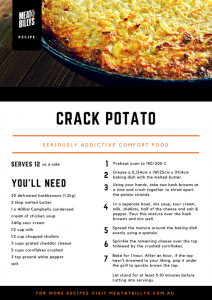 Sarah’s Crack Potato recipe (Billy is Sarah’s husband), has fast become a favourite of family & friends of Meat at Billy’s. We serve it at all of our events and constantly receive requests for the recipe. It can easily be halved but trust us, the more the better. It also freezes perfectly. You’re welcome. Grease a (L)34cm x (W)25cm x (H)4cm baking dish with the melted butter. Using your hands, take two hash browns at a time and crush together to shred apart the potato strands. In a separate bowl, mix soup, sour cream, milk, shallots, half of the cheese and salt & pepper. Pour this mixture over the hash browns and mix well. Spread the mixture around the baking dish evenly using a spatula. Sprinkle the remaining cheese over the top followed by the crushed cornflakes. After an hour, if the top hasn’t browned to your liking, pop it under the grill to quickly brown the top. Let stand for at least 5-10 minutes before cutting into servings.